Located in North County San Diego, Encinitas is one of California's best surfing and beach towns known for it's historic Highway 101 beach culture dating back to the mid-1900s. 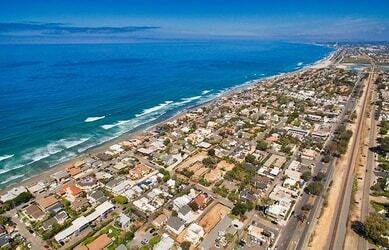 Included below are homes for sale in Encinitas. If you would like more information on any of these Encinitas real estate listings, just click the "Request More Information" button when viewing the details of that property. We can provide you with disclosures, past sales history, dates and prices of homes recently sold nearby, and more. And, if you haven't already, be sure to register for a free account so that you can receive email alerts whenever new Encinitas houses come on the market. Encinitas is located on the northern side of San Diego County, CA. It is a moderately sized city that has around 60,000 residents. The city of Encinitas was incorporated by a majority vote in 1986, unifying its five sub-communities under one legal entity. The neighborhoods that make up Encinitas are Leucadia, Cardiff by the Sea, Olivenhain, historic Encinitas, and new Encinitas. Its name comes from the Spanish word that translates to “little oaks.” Encinitas is located about 25 miles north of San Diego and just under 100 miles south of Los Angeles. Encinitas's central location allows its residents to easily access both major metropolitan areas. Encinitas also has its own thriving job market, with many of its residents working locally. In fact, the residents of Encinitas have an average commute time of less than half an hour, a number that is in line with the national average. People who spend less than an hour commuting each day tend to have a better work/life balance and are generally happier overall. Spending less time commuting means that you will have more time to enjoy everything that Encinitas has to offer. The Encinitas 101 Main Street Association is focused on preserving the area’s unique atmosphere. The town’s rich history and beach vibe combine to make it a unique coastal community. Downtown Encinitas is a hotspot for culture, arts, shopping, and dining. It is also the site of the famous Hansens Surf Shop. This is the oldest and largest surf shop in San Diego, making it a must stop shop for anyone visiting Encinitas. Each of Encinitas’ neighborhoods has its own unique characteristics, but all five are excellent places to live, work, and play. Leucadia is one of Encinitas’ coastal towns, named after the Greek island Lefkada. This area is known for its great surfing and friendly culture that focuses on waterfront living. Its beaches are more secluded than those of the other, nearby towns. This makes it a top choice for those looking to live a more laid back lifestyle without sacrificing any of the luxury of oceanfront living. The homes in this neighborhood line the bluffs overlooking the Pacific Ocean, giving them a top notch view without being too close to the crowds of surfers and beachgoers. Cardiff by the Sea is one of the most famous surf spots on the west coast, with surfers traveling from around the United States to surf the perfect waves of Cardiff Reef. This seaside community is filled with upscale homes and condos that are as picture perfect as the nearby beaches. Olivenhain lies on the east side of Encinitas, right next to Rancho Santa Fe. This neighborhood is primarily composed of single-family homes on spacious lots. Most of the homes in Olivenhain are on lots that range in size from 0.5 acres to 5 acres, allowing their owners to have plenty of space and privacy from their next-door neighbors. These homes are built on winding roads that lace their way through the region’s rolling hills. As a whole, the residents of Encinitas will have plenty of opportunities to participate in cultural activities and artistic events. One of the best known dance studios in the area is Encinitas Ballet, a classical ballet studio that trained several prominent dancers who would later go on to tour the world. The community also hosts outdoor events such as the April Street Fair, a Fall Festival, Encinitas Environment Day, and the Wavecrest Woodie Meet. The Lux Art Institute focuses on allowing its patrons to see the artists’ work in progress rather than just the finished product or piece of artwork. This artist-focused museum operates in what they call a “working studio environment.” The museum frequently has classes and events that are open to the public. When searching gated communities in Encinitas you will find the gated communities in Encinitas are Flair Encinitas, Encinitas Real, Poinsettia Park, Summit Cantebria, Monte Mira, Sage Canyon, Quail Ridge, The Summit at Cantebria, Sandalwood, Costa Laguna Estates, Crestview Estates, Pacific Crest, and Halcyon Estates. Olivenhain gated communities are Double LL Ranch, Wildflower Estates, Knightsbridge Estates, Dove Hollow, and Copper Crest.